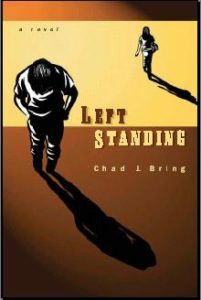 Left Standing is a story about how life-changing conversations can cause someone to be left standing in contemplation as another person walks away. It touches on circumstance, change, and choice. Life has the ability to change directly in front of us without our permission or any warning. At times, we have the ability to make changes, but most of the time change finds us. What we do next is in our power. Do we: deny the change, bargain against it, or accept it? At times, we have no idea we are changing. Sometimes, we can only catch a glimpse of small changes when we look in the mirror, but rarely do we have moments where we can sense ourselves change. Our true character surfaces during these profound moments of contemplation and reflection; it defines us as individuals – our lives are forever altered. These memorable moments don’t happen often in a lifetime; but they occur more than we might realize because seldom are we able to accurately understand the significance of how the moment changed us. It is in these instances of sensing change that we are left standing in contemplation of what we should do, what we should say, and how we should act. These moments, as powerful as they can become, are usually unplanned. You can never truly prepare to say to someone exactly what they need to hear. You can never know how much you may be moved by what they say. These are life-altering conversations that change the direction of our path; changes that determine how smooth the road will be ahead. Reality and recognition become clear as reflection begins. An epiphany is the result. We are left standing before our new path, not always fully grasping how we got there. 2019 Chad J. Bring | Powered By Copywriter WordPress Theme.